To insert a link into your page, press the button on the toolbar or use the Ctrl+L keyboard shortcut. If you want the link to be assigned to certain text, select that text first. If no text is selected, the link URL or email address will appear on the page as is. 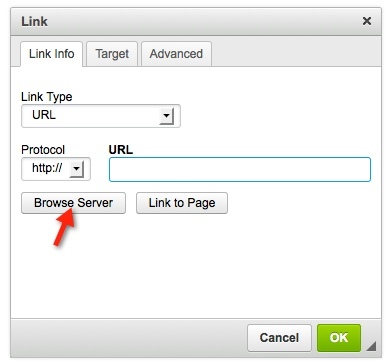 The Link Type is set to URL by default so you can add a website address to your page. For this Link Type, all three tabs of the Link dialog window are available. The Link Info tab is the default tab that opens after you press the button on the toolbar. 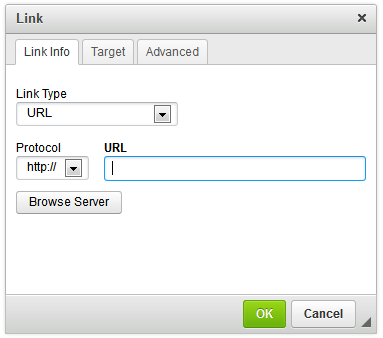 It allows you to choose the Link Type as well as set the link Protocol and URL. Protocol – This is the communication protocol used with the web address. You can choose one of the following options: http://, https://, ftp://, news://, or . URL – This is the website address for the external resource that the link is pointing to. Use the full absolute path. Browser Server - You can also browse the server to select an image or file. If you upload a file using the file manager you can add a link on a page to download the file. Link to Topic - This will open an overlay to link to another page. The Advanced tab lets you configure additional link options such as assigning an ID, a class, a tab index, a tooltip, or CSS-style properties. It is meant for advanced users with knowledge of HTML and CSS. Id – A unique identifier for the link element in the page (id attribute). Access key – A keyboard shortcut to access the link element (accesskey attribute). Name – The name of the link element (name attribute). Language Code – The language of the link element specified according to RFC 1766 (lang attribute). Tab Index – The tab order of the link element (tabindex attribute). Advisory Title – The text of the tooltip that is shown when the mouse cursor hovers over the link (title attribute). 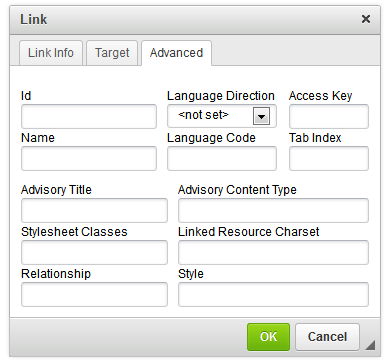 Advisory Content Type – The content type of the link (type attribute). Stylesheet Classes – The class of the link element (class attribute). Note that a link element might be assigned more than one class. If this is the case, separate class names with spaces. See CSS. Linked Resource Charset – The character set of the linked resource (charset attribute). Relationship – The relationship between the current page and the link target (rel attribute). Style – CSS style definitions (style attribute). Note that each value must end with a semi-colon and individual properties should be separated with spaces. See CSS. It is easy to insert clickable email addresses to your pages and even add the subject and body of the email message that will be created when you click the link. 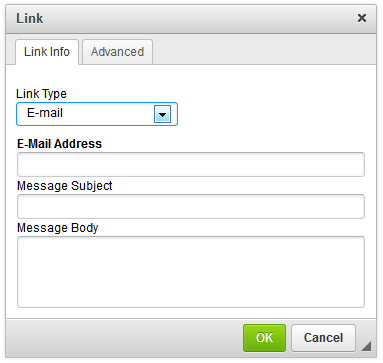 If you want to add a hyperlinked email address to the page, select E-mail from the Link Type drop-down list. E-Mail Address – This is the address of the recipient of the email message. This field is required for the email link to work. Message Subject – This is the default text that will be pasted into the subject line of the email message. Message Body – This is the default text that will be pasted into the email message as its content. For a detailed description of all Advanced tab elements, refer to the Advanced section above. If you want to point to an anchor previously set in the page, select Link to anchor in the text from the Link Type drop-down list under the Link Info tab. By Anchor Name – This is a drop-down list containing the names of all anchors established in the page. By Element Id – This is a drop-down list containing the identifiers of all anchors established in the page that contain the ID attribute. 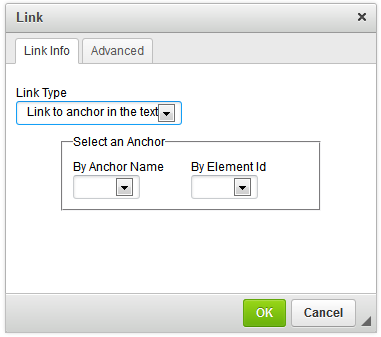 If you do not have any anchors defined in your page, a message telling you so will be displayed in the Link Info tab. This example shows how you can link certain textual fragments (in this case "email campaign") to webpages or online documents, using HTML. To add the link click on Soruce on the WYSIWYG Editor as shown below. Clicking on Source shows you the HTML of the page. Now, locate the text you want to link and add the HTML tag mentioned below. As shown in the above image, paste this HTML tag and replace the link and achor text with your desired ones. In order to create an anchor, enter its name in the Anchor Name text box. Once you click OK, the icon will appear in the page. To remove an anchor, select it and press Delete. Do not use spaces between words in the Anchor Name. If you need a space, put a dash such as "how-to." Removing a link is just as easy as adding it. When the cursor is placed on a link, the button on the toolbar becomes active. Pressing the button removes the link and leaves plain text. Alternatively, you can also open the element's context menu by right-clicking, or using the Menu/Application key on your keyboard and choosing the Unlink command. After you have uploaded a file, you can insert a hyperlink that will download that file. From the editors toolbar select the hyperlink option. From the links overlay select Browse Server, and select the file you want to insert from the file manager.